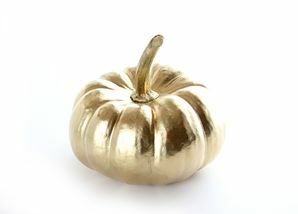 The Golden pumpkin was an artifact available during Halloween 2012, 2013 and 2014 as well. In 2015 it is available year-round, often as a reward for smiting an Undead. This pumpkin is the cousin of the "Great pumpkin" and is suitable for punkin' chunkin' since it smushes instead of flying apart into various bits when chunked great distances. This pumpkin makes a delicious pumpkin pie, if your hero is able to locate the recipe. If the hero carries this in their inventory long enough, it will transform into a gold brick. Otherwise, the shopkeeper will pay a pretty good bit of coin for one. The only requirement for use is to manage to find one that your hero likes amongst all the others in the pumpkin patch, previously hosted in the town of Godville only during Halloween. These can now be found as zero-GP Activatable Artifacts that may be transformed into a log of Gopher wood, Golden Brick or other item. "The Undead Stare Master was killed once again. Made a nice golden pumpkin out of its head." "The golden pumpkin suddenly turned into a golden brick. Pretty good transformation I say." "golden pumpkin - 15:42: The golden pumpkin suddenly turned into a golden brick. That was unexpected." "The golden pumpkin suddenly turned into a golden brick. Yes, it's that easy..."